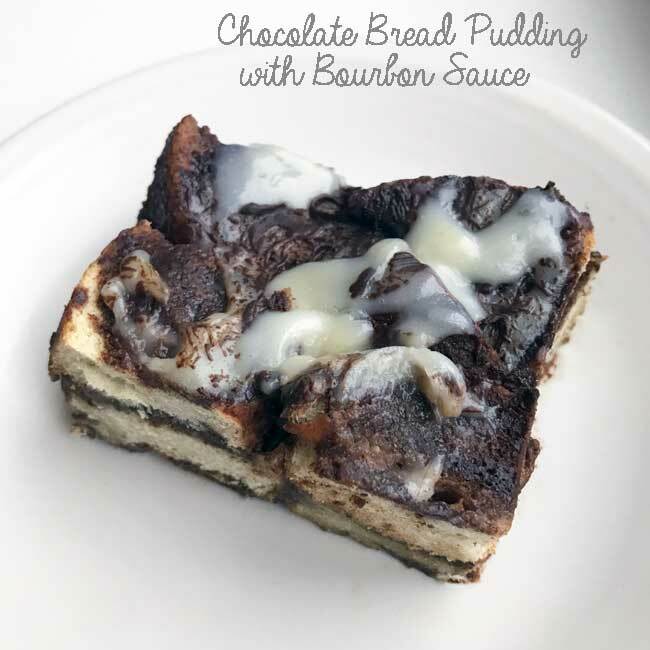 Originally from the new and modernized Southern Living Party Book, this Chocolate Bread Pudding with Bourbon Sauce is perfect for Valentine’s Day. Or at least I think so. It’s probably the third best bread pudding I’ve ever had (the first being White Chocolate Challah and the second being the one served at Smoque). But I’m not an expert on bread pudding and can’t say much other than that this was really, really good. 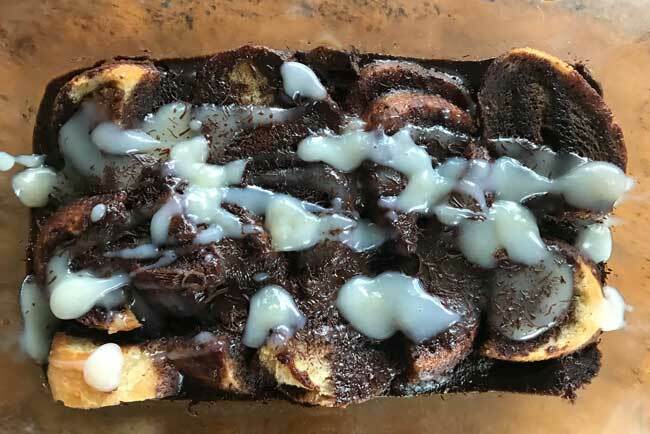 It’s also pretty versatile in that you can make it as a 9×13 inch recipe (as below) or use 1/3 the ingredients and make chocolate bread pudding in a loaf pan. I actually made the loaf pan version twice. The first time I used a baguette and the bread pudding was rather firm and chewy. The custard was so good that no one minded a little chew, but a softer bread works better. The second time I used my Fluffy Dinner Rolls and the bread was still firm, but easier to fork into. Next time (and I plan to make it again soon!) I’ll use Challah. This makes a 9x13 inch pan of Chocolate Bread Pudding with Bourbon Sauce. For a small batch version you can cut all the ingredients in thirds and bake in a loaf pan. Preheat oven to 350 degrees F. Grease a 13x9 inch baking dish. Melt the butter in a large skillet over medium heat. Cook the bread cubes in the melted butter just until they start to look toasty and golden. This should take about 3 minutes Some will be more golden than others. Lay them in the prepared pan. In the same skillet you used for the bread, combine the cream and milk and bring just to a good simmer t=over medium heat. Remove from heat and whisk in the chopped chocolate. When chocolate is fully melted, whisk in the brown sugar, egg yolks and vanilla, then pour over the bread. Cover the baking dish tightly with foil and cut 6 small holes in the foil to allow steam to escape. Set the baking dish in a larger dish (a roasting pan) and fill roasting pan with water to a depth of 1 ½ inches. Bake for 1 hour and 45 minutes or until set. Allow bread pudding to cool for 30 minutes on a wire rack. To make the Bourbon sauce, mix 1 ½ cups milk, ½ cup butter and 1 cup sugar in a saucepan and cook over medium heat, stirring often, until butter melts and sugar dissolves. In a separate bowl, combined the cornstarch and ¼ cup of water, stirring until smooth. Add to the hot milk mixture along with the bourbon and bring to a boil over medium. Boil for 1 minute, stirring constantly. For a small batch version, use 1/3 of the ingredients (28 grams total of egg yolk) and use a large saucepan rather than a skillet. Assemble bread pudding in a 9x5 inch loaf pan. Bake time will be around 90 minutes. I think either would work. When you saute the bread in butter it absorbs the butter but it also dries out a little bit so the bread absorbs a little of the custard. This is definitely a firmer bread pudding, so keep that in mind. It’s not very booze-y unless you do what I did and brush bourbon all over the top while it’s setting. Recipe doesn’t say to do that but we like bourbon. Really talking my language with this flavor combo…plus I love booze in desserts. Do you think this needs to be made with dried out challah or would fresh work?